Many safety systems and autonomous cars are built around video processing. We offer cost effective and proven hardware solutions to support your embedded vision development. We offer hardware solutions to support ADAS and autonomous vehicle development, ranging from development tools over reference implementations / reference kits to ready-to-go small volume production modules. Our second generation video recording module addresses a need many ADAS developers will face sooner or later: How to record video from multiple automotive cameras (LVDS or Ethernet) synchronously, in a vehicle, efficiently, and without breaking the bank. ADAS Video Box 2 is used by several customers in their development of surround view system, vision-based autonomous vehicle development, and stereo camera development. Video Box 2 has two PCIe M.2 Key-M slots, supporting up to two 2TB SSDs uSD (up to 256GB). An additional SATA interface is available. Networking: Video Box 2 support four 4 CAN/CAFD interfaces, five Broad-R interfaces and one GigE Ethernet interface. Video Box 2 has two HDMI outputs and one FPDLink3 output. Video Box 2 is made for automotive applications, powered by 9V to 16V DC. Video Box 2 is available directly from Cogent. Please contact us by email at orders@cogentembedded.com for information, availability and pricing information. Our embedded ADAS ECU is ready to go for small-volume production applications or prototype installations. The embedded ADAS ECU (EA1) is based on a Renesas R-Car V3M. It supports 4x 1.3MP video inputs @ 30 fps. We currently have options with either a TI DS90UB960 quad deserializer hub or a Maxim MAX9286 quad deserializer hub. The Embedded ADAS ECU 1 integrated into existing vehicles with 2x CAN/CANFD and provides easy development access through 1x GigE interface. In cooperation with Semiconductor vendors we have prepared several development kits. A frozen or delayed camera image displayed to a driver might pose a safety risk. Cogent Surround View has been designed to address this risk. A surround view supervisor daemon constantly monitors the validity of incoming video data, and switches the surround view output into a safe state (e.g. by showing a warning screen) when an input anomaly has been detected. Every car is unique. And every camera installation is subject to mechanical tolerances. Cogent Surround View includes an offline (factory) calibration component to account for these inevitable built tolerances. Offline calibration detects visual targets, e.g. 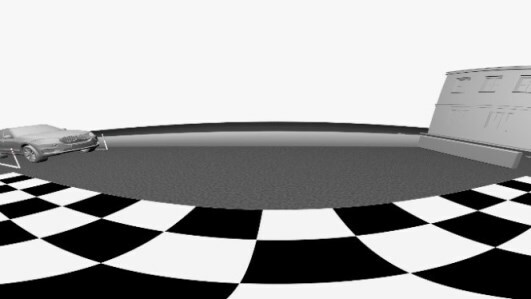 black dots on a white background that are placed around the vehicle within the overlapping view of two cameras. 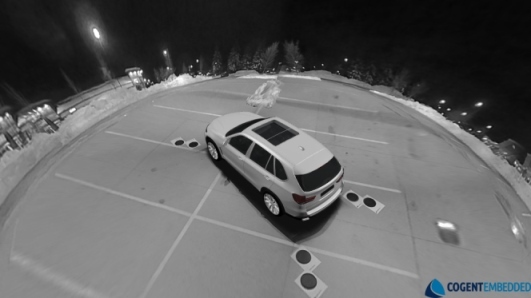 Combining the recognition of targets in each image with the knowledge of where the targets are in respect to the vehicle allows offline calibration to calculate a correction factor that is applied to the nominal camera position and orientation. Offline calibration makes sure that objects transition smoothly and without visual artifacts like double-images from one camera view to the next. Even a perfectly offline calibrated surround view system is subject to changes over time: Aging mechanical components, vehicle loading and stress due to thermal expansion and contraction can cause slight but noticeable changes to camera alignment. 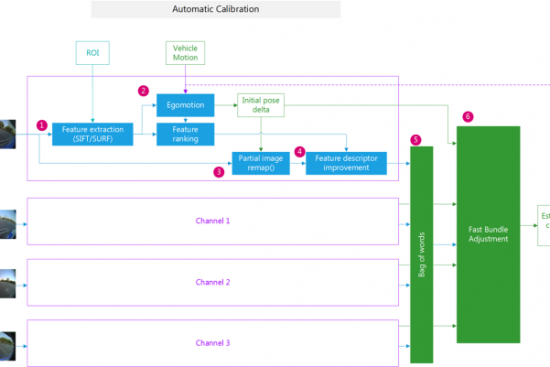 Online calibration continuously monitors for such changes and takes corrective action. Online calibration is based on scale-invariant feature transform (SIFT) and speeded up robust features (SURF). 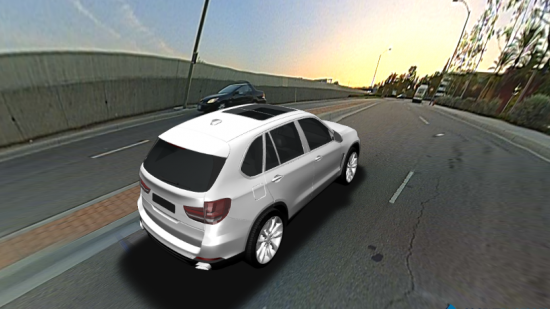 Using vehicle sensor information the movement of features in the different camera images is compared with the expected movement based on the vehicle’s egomotion. A partial image remap is applied based on pose correction estimations. 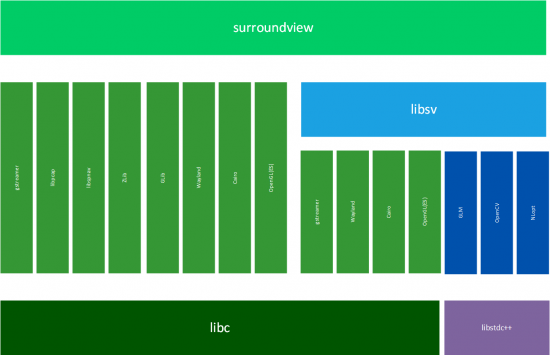 Cogent Surround View leverages several open source packages. GStreamer is a library for constructing graphs of media-handling components. Cairo is a 2D graphics library with support for multiple output devices. EGL is an interface between Khronos rendering APIs (such as OpenGL, OpenGL ES) and the underlying native platform windowing system. GLib is a general-purpose utility library, which provides many useful data types, macros, type conversions, string utilities, file utilities, a mainloop abstraction, and so on. OpenGLES is a royalty-free, cross-platform API for full-function 2D and 3D graphics on embedded systems – including consoles, phones, appliances and vehicles. Wayland is intended as a simpler replacement for X, easier to develop and maintain. LibPCAP is a system-independent interface for user-level packet capture. OpenCV (Open Source Computer Vision) is a library of programming functions mainly aimed at real-time computer vision. NLopt is a free/open-source library for NonLinear OPTimization, providing a common interface for a number of different free optimization routines available online as well as original implementations of various other algorithms. GLM (OpenGL Mathematics) is a header only C++ mathematics library for graphics software based on the OpenGL Shading Language (GLSL) specifications. ZLib is a software library used for data compression. LibSPNAV is a library to access 3D-input-devices. 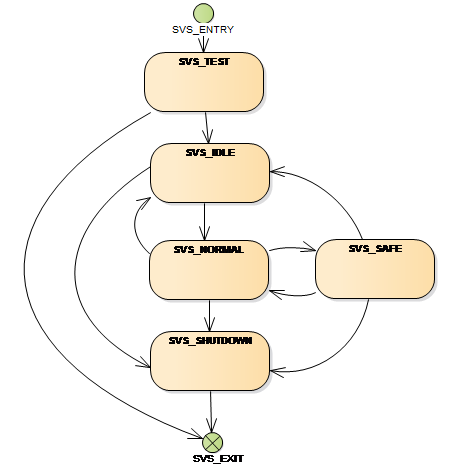 Cogent’s embedded surround view code is highly customizable. In fact, there are hundreds of parameters that can be tweaked to achieve just the right look for any given vehicle. 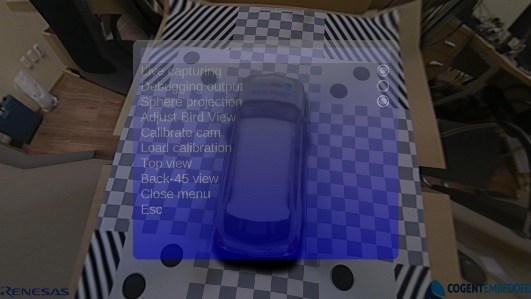 A set of PC tools is available to simplify the task of adapting Surround View to a given vehicle. The tools allow easy configuration of camera locations, provide intrinsic and extrinsic camera calibration, mesh configuration, virtual camera positioning, and user interface configuration. 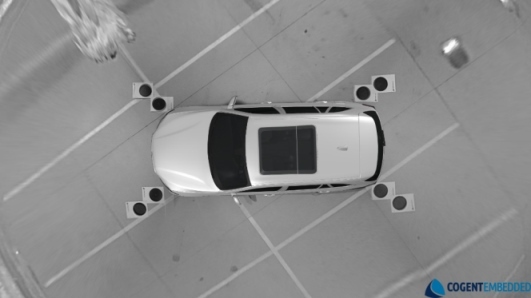 For the US market the toolchain enables developers to create an “FMVSS 111” scene to verify that the vehicle meets the federal motor vehicle safety standard. 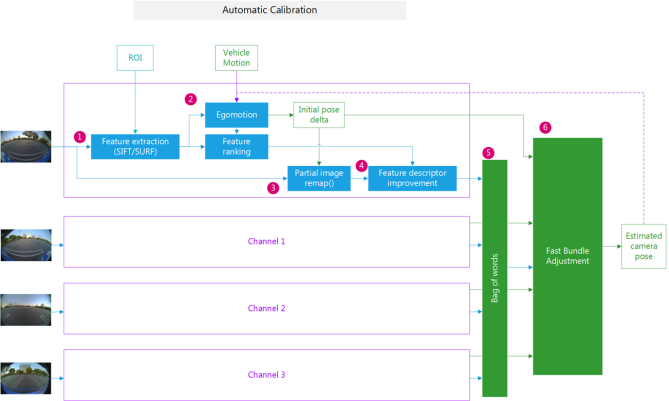 A camera calibration tool is available for demo installations in which camera intrinsic parameters may not be known. Cogent Surround View comes with built-in video recording and video file playback capability. This eliminates the need for complex and expensive external tools, allowing developers to test the system with a standard hardware prototype. GPU beneficial, but not mandatory. Cameras Front, left/right side and rear camera required. Tested with OV10635 and OV10640 imagers. LVDS and MJPEG cameras supported.